Unlike its neighbors to the north, the Netherlands doesn’t become a picturesque snowy wonderland in the winter thanks to a relatively temperate climate. Without the wintry weather, the Dutch rely on other means to make the season feel festive. One of the main ways is through food. There are limited-release gingerbread snacks, fried dough covered in powdered sugar, and a long list of savory, heartwarming meals. These are the uncomplicated winter Dutch foods that you need to know. Literally translated as “pepper nuts,” pepernoten are small, gingerbread-like cookies. They’re only available in the fall leading up to the celebration of Sinterklaas on December 5th. After that, they abruptly disappear from store shelves until the next year. There are several kinds of pepernoten. There’s the classic kruidnoot, which are small, round gingerbread cookies roughly the size of a bottle cap. Kruidnoots also come covered in either milk, dark, or white chocolate. Recently, there’s been an increase in “artisanal” pepernoten with a variety of different flavors. 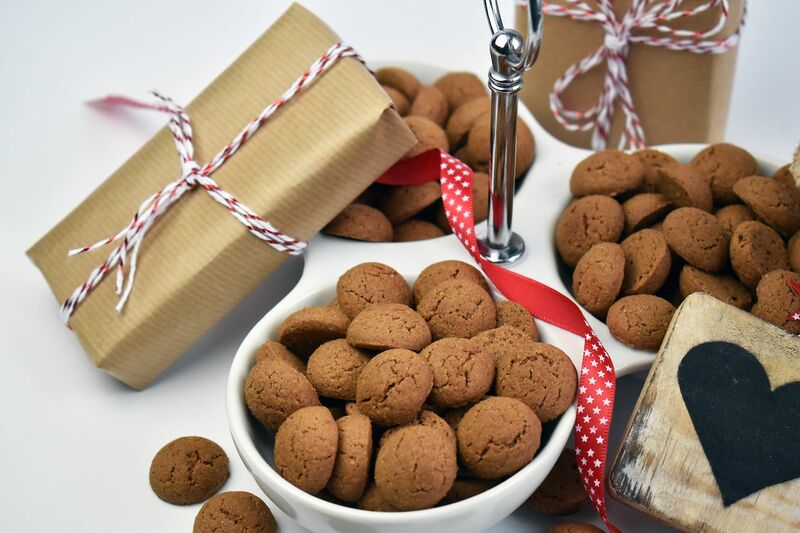 A company called Van Delft Biscuits sells flavors like truffle, tiramisu, and buttered popcorn from pop-up stores in the days leading up to Sinterklaas. 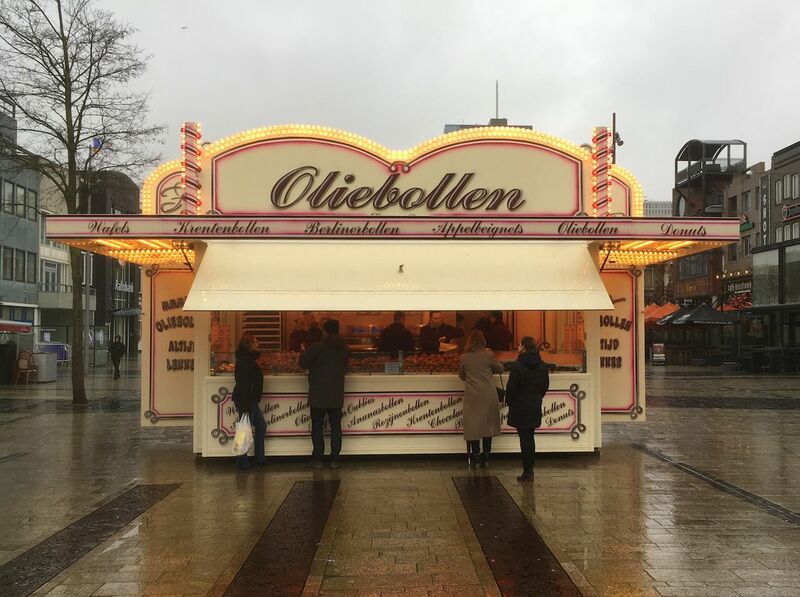 When the days get short, oliebollenkramen (oliebollen food stalls) pop up like mushrooms. Oliobollen are fried balls of dough (the name translates to “oil bulbs”) that are usually lightly dusted with powdered sugar. While oliebollen are available from pop-up stands all winter long, they’re traditionally eaten on New Year’s Eve. No one knows exactly why oliebollen became the food of choice to ring in the new year. One theory is that in pagan times, it was believed a spirit named Perchta sliced open people’s stomachs to eat what they had eaten. The oily oliebollen made Perchta’s sword bounce or slide right off. Another origin story dates back to Jewish refugees fleeing Portugal who brought the food to the Netherlands in the early 1500s. Regardless of origin, the tradition has been going on for centuries. Today, the average Dutch person eats eight oliebollen per person, per year. Oliebollenkramens also sells other things like krentenbol (oliebol with raisins), appelflap (crispy fried apple rings), Belgian waffles, and oliebollen filled with custard, Nutella, or fruit. Poffertjes are perhaps the most uniquely Dutch sweet treat. About the size of a muffin top, these tiny pancakes are made with buckwheat flour batter and topped with something sweet. 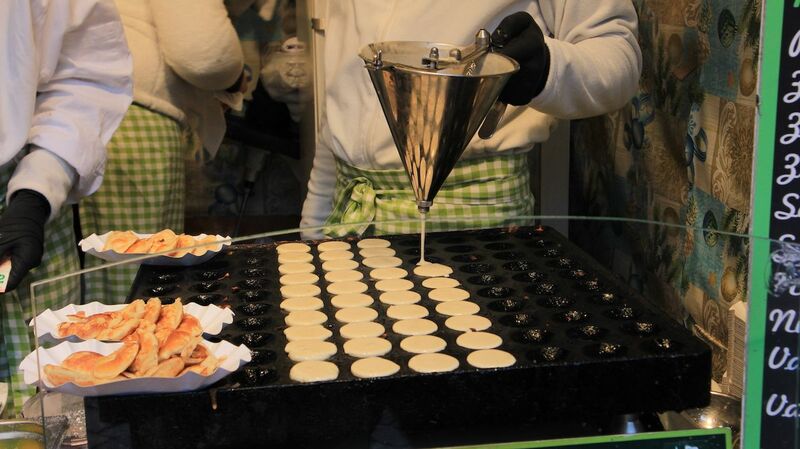 Poffertjes are cooked on a special griddle to keep them golden and fluffy. Then there are the toppings. The default poffertjes topping is one of the best: melted butter and powdered sugar, eaten with a toothpick that has a Dutch flag on it. You can also get toppings like Nutella, syrup, fruit, or a liqueur like advocaat (somewhat like Eggnog) or Baileys. Like oliebollen, you can get poffertjes at a stand. But what’s really fun is eating them at the poffertjessalon. These kitschy, temporary restaurants are a warm and cozy place to get out of the cold and enjoy some seriously good pancakes. There are three sacred pillars of Dutch winter food: potato, vegetable, and meat. These three elements make up the traditional, everyday winter meals that the Dutch have been eating since the introduction of the potato to Europe around 1600. Stamppot is one of the oldest traditional Dutch dishes. 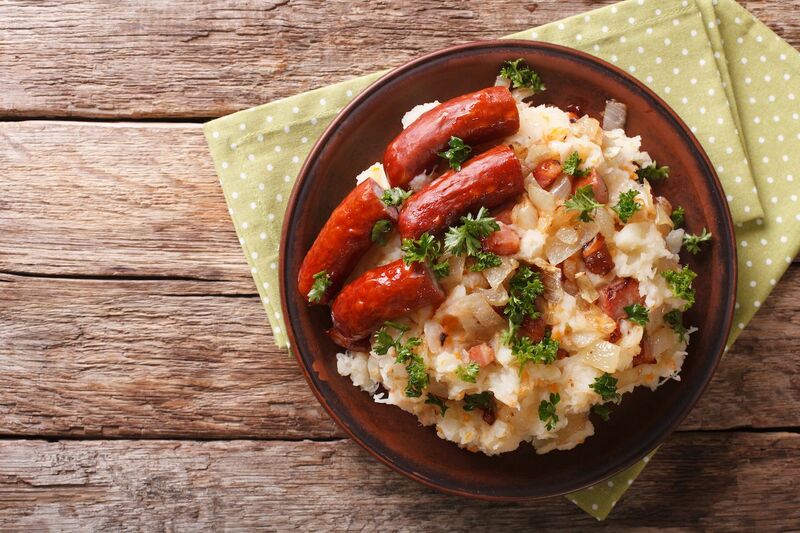 Often described as the Dutch national dish, stamppot is made up of kale and potatoes mashed together and served with rookworst (smoked sausage) on top. The most iconic rookworst is the kind you get from the Dutch store chain HEMA. Other vegetables you can mash in with potatoes include carrots and onions (called hutspot), endive, sauerkraut, and sweet braised red cabbage. If you’re not in the mood for rookworst, you can also have meatballs or some other kind of sausage on the side. And don’t forget the gravy! Ewertensoep (Dutch pea soup) is another typical winter dish that fits into this holy trinity category. Made with dried split peas, carrots, and starchy celery root, a Dutch pea soup is considered done when you can stick a spoon in it and turn the pot over without the spoon falling out. To serve, throw in some crispy bacon or, you guessed it, rookworst. In contrast to the Holy Trinity Foods, gourmetten is something you do on special occasions. The tradition is to get together with friends or family, usually on Sinterklaas or Christmas, and you cook your own meat and vegetables on a long tabletop grill. Then, while you’re eating the first round, you have a second round already cooking. This can go on for hours, and is an event in itself. In December, all Dutch supermarkets will offer bite-sized packages of meats, sausages, fish, and vegetables like peppers, mushrooms, and onions. A selection of creamy sauces and mayonnaise will also be present on the table to accompany the meal. Slices of crusty bread with smeerkaas (spreadable goat cheese) and kruidenboter (butter with herbs and garlic) will also be available. To end your gourmetten session, you may have stoofperen. 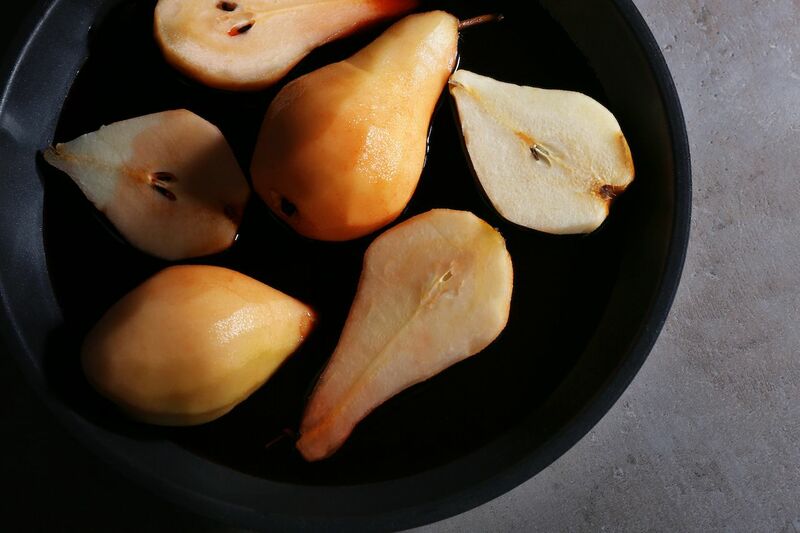 These are pears braised in red wine, sugar, and spices, served either cold or warm with a scoop of vanilla ice cream.